How Do You Like Your Detectives? The young man's expression soon gave way to wariness as he looked Bruce over. There was a sudden alertness in those slim shoulders and Bruce figured the kid had seen some trouble. Enough to know Bruce looked like the kind of guy to be mixed up in it. "Relax. I don't know you and no one's payin' me to." 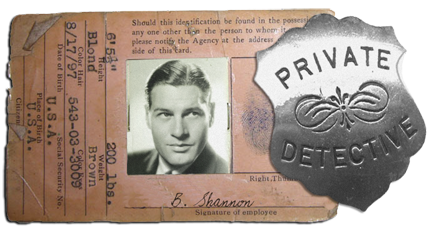 Bruce Shannon is rugged and rough around the edges. He drinks, he smokes, he has a healthy appetite (that goes for food, too), and he'll be damned if anyone's gonna give' im grief about it. He's lived too long and seen too much to worry about where he's gonna end up. The way he sees it, you're gonna reach the end of the line someday, so why not enjoy the ride? He's an investigator for hire during the dirty 30s, doing what he needs to do to solve a case, but always in the interest of the client. For him, finding a balance between vice and virtue is a constant struggle. In fiction and the movies, there are all kinds of detectives with a host of quirks and foibles. From Raymond Chandler's tarnished knight, Philip Marlowe; Dashiell Hammett's resilient, Sam Spade; to Sir Arthur Conan Doyle's most famous substance-abusing sleuth, Sherlock Holmes. Lindsay Marriott: I'm afraid I don't like your manner. Philip Marlowe: Yeah, I've had complaints about it, but it keeps getting worse. Brigid O'Shaughnessy: I haven't lived a good life. I've been bad, worse than you could know. 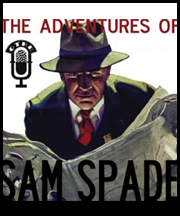 Sam Spade: You know, that's good, because if you actually were as innocent as you pretend to be, we'd never get anywhere. Nick Charles: The murderer is right in this room. Sitting at this table. You may serve the fish. Paul Galesko: [gesturing at Columbo's camera] Lieutenant, may I ask, what's the meaning of that? Lt. Columbo: You noticed. I'm sorry, sir, I tried to be inconspicuous. Paul Galesko: Well, you failed, miserably. Bingo Addict: Do you want to rub my lucky troll? It's good luck. Adrian Monk: Uh, no, thank you. Bingo Addict: Go ahead. Rub the troll. Adrian Monk: No thank you. Uh, I've been rubbing trolls all day. Bingo Addict: If you don't rub the troll, it's bad karma. Constable George Crabtree: Oh, sir! You have to try one of these. I've had four already this morning; it's the damnedest stuff. Inspector William Murdoch: What is it? Constable George Crabtree: Coffee! I've only ever heard of it. Big in Europe, apparently. Inspector William Murdoch: [Murdoch tastes it and grimaces] Terribly bitter. Constable George Crabtree: I thought so too at first, but it grows on you. Inspector William Murdoch: Why on earth would they serve this when we have tea? I don't see *this* catching on. Constable George Crabtree: Oh, I wouldn't be so sure, sir." So what's your favorite type of detective? Hardboiled PI? Victorian Sleuth? Urban Maverick? Do like them sinful or sweet? Inquiring minds want to know. When Love Walked In now available. Coming February 1st, 2012 from Torquere Press! Bruce Shannon is a Private Investigator dealing with case after case of missing persons and infidelity. 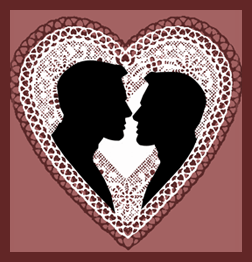 None of which inspire warm, fuzzy feelings during the week of Valentine’s Day. Then again, Bruce isn’t exactly a fuzzy feelings kind of guy, which suits him just fine. He doesn’t need anyone anyhow, only his cat, Mittens. That is, until the handsome Jace Scarret wanders off the street and into Bruce’s life. Will Jace end up showing Bruce that maybe Valentine’s Day isn’t so lousy after all? Unaware of Bruce's ogling--thank goodness, Jace set a plate of toast on the table. "I hope you don't mind, but I thought I could thank you by making you breakfast. I didn't know what you liked, so I made a little bit of everything." "You made all this?" Bruce asked, dumbfounded. He was pretty sure all he'd had in his refrigerator were a few eggs, a meager block of cheese, and a few strips of bacon. "Yes. I hope you like it." Jace poured them each a cup of coffee and joined him at the table. The first bite was enough to make Bruce melt. My god, the man could cook, unlike Bruce who had nearly burnt the place down once attempting to boil an egg. "Where have you been all my life?" he moaned, enjoying another forkful. He glanced up and nearly choked on his eggs. Whatever reaction he'd expected, it sure wasn't the one he received. Jace was staring down at his plate, his cheeks a bright pink. It occurred to Bruce that there was something he'd like for breakfast far better than eggs. To make matters worse, when Jace met his gaze, it was all too clear the guy was happy to be that something. That couldn't happen. The poor fellow had enough problems without adding the complications of a tumble in the sack. Besides, the last thing he wanted was for Jace to think Bruce expected something from him after all. Clearing his throat, Bruce turned his attention back to his breakfast. "This is really good. Thanks." Nifty News for a New Year! Well, it's the start of a brand New Year, and what a start it was! Imagine my surprise when I checked my email account on the 1st to find Dreamspinner Press expressing their interest in The Auspicious Troubles of Chance. I was absolutely thrilled! And so, my second novella is now in production! The Auspicious Troubles of Chance is a Historical Romance that spans the life of Chauncey "Chance" Irving, a troublesome young man trying to escape his past, and in an effort to do so, is set on a path that leads him to the middle of the Sahara and to Captain Jacky Valentine. Jacky is big, strong, ruggedly handsome and—when he’s not turning purple from his claustrophobia, too cheerful for his own good. He has no personal boundaries, has a devilish sense of humor, and is too charming for Chance’s liking. Not only does Chance have to deal with the very new and disturbing feelings Jacky seems to be triggering within him, but soon he has to deal with the man’s unofficially adopted brood: three misfit youths Jacky’s taken under his wing, all of whom are just as grumpy and broken as Chance. This is the story of a young man clinging on to hope and finding the will to move forward toward a future where he can not only become the man who he knows is buried deep down inside, but where he can find the love and family he thought he would never have again. Also coming soon, from the wonderful people at Torquere Press is my first novella: The Amethyst Cat Caper. Two years ago, Remington Trueblood left England and everything he held dear, all in the hopes of leading the kind of life he never would have been permitted had he remained under his tyrannical father's rule. Now the successful owner of The Purple Rose Tea House, Remi has come across the perfect addition to his business: a stunning amethyst cat. But Remi's acquired something else with his latest purchase: the attention of the notorious Gentleman Thief, who not only seems to have an interest in Remi's cat, but in Remi himself! Pinkerton's Detective Stanley Hawk doesn't know the first thing about tea. He's strictly a java kind of guy. What he does know, is crime, and someone's committed one. Hawk has every intention of getting his man, and as his investigations lead him straight to Remi, never have truer words been spoken. Can Remi and Hawk resist each other long enough to figure out who the thief is and what the heck is going on? From a quirky antiques shop, to a high-society tea house, to the rainswept streets of Chinatown, The Amethyst Cat Caper is a fun romp through 1930s New York, so put the kettle on or grab yourself a cup of Joe, and enjoy! The release date is TBA, but will be near the end of Feb. I'll be putting together all kinds of fun promotional items for its release, so stay tuned!